Halloween is right around the corner, and that means all things goblins, ghouls and ghosts await! What makes Halloween even better than tricks or treats and candy? Haunted attractions. There is nothing better than an amazing haunted house, and Indiana has some of the best of the best to offer! Be prepared to be scared when you visit Indiana’s most haunted houses. 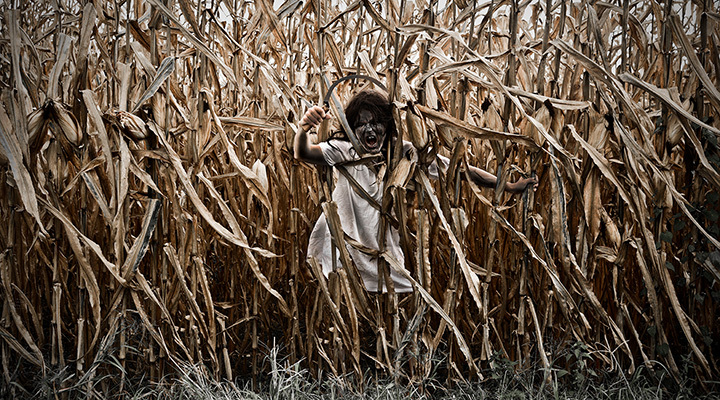 Note: some of these attractions are not for the faint of heart, so enter if you dare! Small towns are not always what they seem. Each comes with their own sets of quirks, but in Indiana, insanity abounds at the Edge of Insanity haunted attraction. Every year on Halloween, Weitle’s Asylum comes alive as former victims come out to seek revenge against Dr. Weitle. Filled with chills and thrills and heart stopping characters, it’s easy to see why this scary attraction has been nominated for the last two years as a top-rated attraction in Indiana. Come to Seymour, Indiana, and tour one of the best haunted houses in Indiana. It’s a favorite among horror movie fans thanks to the Fear Fair Film Fest which pays homage to Hollywood’s creepiest moments. At Fear Fair, the monsters will find you and play on what scares you the most. Monsters await at every turn, ready to reach out and grab you when you least expect it. Fear Fair is Indiana’s most haunted and most beloved attraction for those who love to be scared. Frightmares is back and is better than ever! Owners Alex and Christy Phipps and Kegan Inman have made it their goal to provide high quality haunted entertainment guaranteed to scare, and give back to their community. Come to the Haunted Angelus House in Indianapolis, Indiana, and be scared for a good cause! The Haunted Angelus House raises money each year for the Angelus, a cerebral palsy group in Hudson, Florida. The attraction is 13,000 square-feet of thrills, chills, and spine tingling scares! The haunted house is a family friendly haunt, but it’s not recommended for very young children (under the age of 13). General Stillwell has come back from the war once again in Anderson, Indiana. Upon arriving, he’s found the ghosts of his past have taken over his home and are haunting his family and staff. Journey through the mansion and find yourself lost in time with the tortured souls that remain. If you survive the Manor, you’ll venture farther and ask yourselves if nightmares can only happen when you’re asleep as you come upon a Madame Isabell Marinska and her band of misfits. The house is over 30,000 square-feet of fright, so there are plenty of scares to be had. Journey through the haunted halls of the Historic Hall School House this Halloween and be prepared to feel your heart leaping out of your chest as you frantically search for a way out! The Grim Reaper is your host if you have the courage to visit this haunted attraction, and he’s brought some friends, some all of us know quite well: Freddy and Jason, Leatherface, and many more! This exhibit is not recommended for children under the age of ten or those who are faint of heart or have heart conditions. In 1692, Dr. E. Rex fled his home on the East Coast and settled in Hancock County, Indiana. Though not many know why he fled, its rumored that he was involved in numerous acts that led to the Salem Witch Trials. Following his settlement, people and animals slowly began to disappear. The people of the town had him hanged for his crimes against nature, though he never disclosed the location of his lab. It wasn’t until years later that it was discovered, and it’s said that his maniacal laugh can still be heard for miles around. Watch your back at The Haunted Loft, or you could just be Dr. E. Rex’s next victim! Come to the attraction voted No. 1 for most original content and see for yourself why this haunted attraction has been scaring Muncie residents for the last ten years. Enter and find yourself winding through maze after maze, holding your breath as your turn each corner and find yourself fighting back fear as you lay your eyes upon some of the most gruesome and bizarre scenes you’ve ever seen. The blood will fly and that sound you hear? That’s your heart trying to escape. This attraction is one of the best in Indiana, but it is not recommended for children under the age of 13 or for those who are faint of heart. Small towns are the ones that often have the most secrets and the most surprises. Streaper’s Nightmare is one of those surprises, and worth every minute! Travel through the creepy estate belonging to the now deceased Geoffrey Streaper and try to outrun his psychotic family and friends. Travel through the maze of ‘Death Awaits’ and enter the family home. Be careful not to make yourself at home, or you might just become the next meal! One of the most popular attractions at Streaper’s is the replica of Mr. Streaper’s Traveling Circus in which Streaper himself murdered his visitors. It’s scary and exciting, and not recommended for children under the age of 13. Journey to southern Evansville, Indiana this Halloween and visit one of the state’s creepiest haunted houses! Each year comes with a different theme, and the attraction has been going strong for over 35 years, starting back in 1980. Find your way to a hidden portal and travel to where time has frozen, and the beasts have awakened. The attraction is family friendly and a fun time will be had by all…if you can find your way out!